Our ‘must have it now’ approach has found its way into every aspect of modern life. So much so that when we can’t have what we want our irritation and impatience can easily evolve into anger. Our sense of entitlement has bred a misunderstanding about the change process. It seems that now many self-help gurus and spiritual commentators are offering a ‘quick fix’, the promise of immediate change with less and less effort. We believe this is doing a disservice because it offers hope, even certainty, in what are often unrealistic time-frames. There is no doubt that there are some issues that respond well to short-term intervention, however, if one is pursuing sustainable solutions, trying to fix deep or life-long issues, trauma, significant mental health problems and addictions, then these are generally not things that can be fixed overnight. Our model is built on various psychological traditions, which until the late 1870s were an integral part of mainstream philosophy. Those aspects of philosophy that put greater emphasis on the emotional elements of the human condition were then formulated into the discipline we now call psychology. It’s at this point of divergence we believe something was lost – a dilution of some of the ancient, potent ideas and principles. Philosophical thought was the first to examine the mind and behaviour. This began in ancient India, China, Egypt, Greece and Persia. Many classical works were produced at that time – each country and culture presenting the human experience through vast texts, poetry, prose and beautiful story telling. In the creation of psychology as a separate school of thought, some of the esoteric qualities and wisdom have been lost. At Reach we have drawn on both the philosophy extending back before Christ as well as the psychological traditions beginning in the late 19th century. Both have different things to offer and in our view are made richer through their amalgamation. One of the primary things we have lost with the division between philosophy and psychology is that sense of respect for time and the healing process – something much more evident if you consult some of the ancient texts of Patanjali, Confucius, Lao Tzu, Mahavir, Buddha and the Sufi Saints. The masters, teachers and sages of those times had a deep respect and reverence for time and its relationship to change. They knew both were perpetually influencing life’s unfolding. They also recognised and applied the natural laws to their philosophy, because they understood those laws were the essential cogs driving the universe. Since we’ve tried over the last century to ‘improve’ the psychological models and the interventions to achieve change more quickly, we have increasingly disregarded the nature of change, which is reflected all around us. The solution-focused traditions have conceived many offspring, each offering a quicker, ‘better’ route to healing and recovery, but how many of these are truly sustainable? Can we manipulate and manoeuvre our way round the natural laws? Clearly there is a school of thought that has emerged suggesting we can, but is there an ‘overreaching’, maybe an arrogance, that has found its way into some aspects of psychological research and methods? We believe there is. The evolution of NLP, CBT, EMDR, EFT and others are techniques we welcome and their contribution needs to be acknowledged. However, there does appear to be a ‘panacea mindset’ that often is aligned to these methodologies. In some quarters they are presented as the ointment for every ailment and unsurprisingly clients and patients expect immediate relief from these treatments – but their limitations equally need to be acknowledged. Our clinical experience and research shows that there are many people still ensnared by their nemeses even after such interventions. We believe that this is because these short-term treatment programmes do not always identify the underlying causes of people’s issues, because the time-frames they operate within do not afford sufficient exploration for these to be illuminated. If we use nature as a mirror she presents us with many clues with regard to the process of change. The seasons tell us that she will not be hurried. Regardless of what we do, nature faithfully changes her costume every three months. This is of course reflected slightly differently according to the part of the world we inhabit. Spring becomes summer, summer becomes autumn, autumn becomes winter and the cycle begins again – each phase taking approximately three months. At every stage within each season a multitude of changes, largely unseen, are taking place but the process rarely deviates from the time-honoured contract. The body has its seasons too. There are literally billions of activities taking place simultaneously, all working tirelessly to keep us alive. At the cellular level cells are busy producing energy to carry out countless activities, imbibing nutrition, excreting waste, all beautifully choreographed by light. Approximately every twelve weeks the direction and the destiny of cells change, as new cells emerge replacing old ones – the previous instructions passed on to the new generation of cells who obediently honour what has gone before. This seasonal change at the cellular level is also mirrored in the global changes of the body. Every seven years, just as the snake sheds its skin, we too sit in a different skin by the time we are seven, fourteen, twenty-one, and on it goes – every seven years, the body is renewed at every level – cells, tissues, muscles, organs, all part of the promise of further life. The cosmos reflects the rhythm and nature of change too. The earth travels round the sun over a period of three hundred and sixty five days, which is something we are all familiar with and within that annual cycle are the cycles of days and nights, weeks and months. These patterns remind us that the universe works in this way. There is an order, a precision, a design and when we go against that we create tension, conflict and even chaos. It would be reasonable to ask what this has got to do with the therapeutic process… everything. Therapy and personal development are simply methods that are designed to help us better understand the human condition, so we can engineer change that is beneficial and resolve issues that limit our development. But how can we do this if we are not honouring the principles of the world we inhabit? Why do we believe we are above the natural laws? Even worse, why do we think we can improve on that which has not fundamentally changed – namely the way change itself works? At Reach we do not believe we can improve on the governing principles of the universe. In fact we would go further and say it is folly to think that we can and it is this attitude that has brought so many environmental challenges to our door. This is why The Reach Approach is more than a counselling or psychotherapeutic model because it embraces numerous traditions and disciplines. It recognises that history, philosophy, science, religion, spirituality all have something valuable to offer and that the migration of our species around this planet, spawning many languages, different cultures and traditions has also much to teach us in our pursuit of emancipation. We do not believe that we can actually be free without slaying ignorance – which means embracing much more than the education we’ve had and the social contexts we‘ve grown up in. It means surrendering what we ‘think’ we know in order that further knowledge and wisdom can be imbibed. This requires great humility because so much conflict is based on opinion and dogma. ‘Change is a process, not an event’. This is not a sound bite or a catchy ‘new age’ phrase. It’s a deep and eternal truth. If we are expecting to really transform habits, patterns and drives that are feeding our unconscious and subconscious minds, then we need to recognise it’s only when we meet the primary needs of the mind, body, spirit and environment (The Story of Health) that we are likely to experience the change that we seek. A single intervention or moment in time will rarely erase that which has taken years to be created. So the therapeutic process is not just about fixing a problem, it’s about learning the skills to live more mindfully, living lives that are steeped in an understanding of how we as humans work and how we relate to our environments, because the two can never be separated, which is one of the reasons why nature offers many of the clues in relation to the nature of our own growth. The diagram above is a simplification of what we call ‘All You Need to Know’, which describes the paradoxical journey of personal growth. At it’s essence is the formula that we believe is the cornerstone of positive change i.e. Knowledge + Application = Personal Power. It is the lack of consistent application that denies many of us the promise of our potential – it prevents us from experiencing the infinite possibilities that life presents us with each day. If we can embrace this formula and respect the nature of change then the miraculous will become part of our personal landscape. 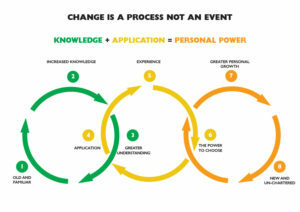 To understand more about the process of change take a look at the mind map summary (see the link below).